How does Los Angeles – its people, buildings and infrastructure establish a restorative, long-term relationship with the environment that hosts it and the financial systems that support it? Read Jack Eidt’s essay featured in Win:Win Journal. A City in Need of a Thousand Communities: Subway-to-the-Sea and other public transit manifestations presage a mighty potential for Los Angeles: community-generator. Yes, they require billions of dollars investment and years of construction dust and detours, and never quite solve traffic congestion. Yet, alternative transportation that creates living, walking and working hubs can transform this unsustainable, fossil fuel addicted, smogged-out polycentric megalopolis. Despite losing ballot Measure J and redevelopment funding, the Los Angeles Metropolitan Transportation Authority seeks to finance construction of a dozen planned transit projects to draw people out of our gridlocked cars. To navigate with the senses and interface with our millions of tattooed and nicely coiffed neighbors. Our multi-lane traffic-centric thoroughfares paved over floodplains, foothills and valley-bottoms, spreading people about into master-zoned segregated-land-use districts relying on the car to connect us with each other. Orchards and coyote wilderness became homes and parking-lot-encased shopping centers. Developers and obedient planners and decision makers forgot the center cities where communities had congregated, worked, played, created, arrived on trains and buses, and lived and shopped next to one another. As people clamored to escape the urban miasma, new sinking pools of landfill-going trash piled up on newly-paved street corners adorned with pre-chosen tree species and pansies to make it all look lovely. Single-use zoning created the many-too-many sleepers with nowhere to go, city centers that emptied of life after the five pm bell rang, massive shopping centers that required a shuttle bus from the overflow parking to the superstore Wal-Mart. Consider that LA has few local parks, communal bikeways, or public gathering points. Walking is something you have to drive to do. Elysian, Griffith, Santa Monica Beach, Topanga State all exist on the margins, freeway close, sigalert-breakdown-construction-detour-far. People are communal animals, and they need to come together unobstructed by ignition-switches, gas-stations, and freeway ramps, but how? No one solution exists to remedy our sprawling suburb-opoli. We can, however, re-create our city. We can grow up, which signifies maturation as well as density, living above shops, lofts doubling as offices, sharing parks instead of private backyards. 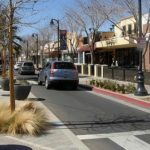 When the Gold Line wound through historic South Pasadena, the city conceived a transit-oriented village to meet the community’s concern for neighborhood integrity and conservative revitalization. Cafes and boutiques anchored the Mission-Meridian station, flanked above and aside with higher density condominiums, live-work lofts, pocket parks, and Craftsman-style single-family homes. Parking went subterranean. Walkers, bikers, shoppers and commuters followed. Old Town Pasadena, the Downtown Arts District, and Hollywood Boulevard have fulfilled the even a wider notion of walkable urban communities, yet subway access remains limited to a fraction of the metropolis, and automobile disposition comes at a premium. Third Street Promenade, named for its anomalous foot traffic-shopping-dining-experiment, necessitates an extensive parking scheme, still waiting to unclog Lincoln Boulevard and the McClure Tunnel, someday, not soon enough. Consider how LEED environmental standards have reshaped the Neighborhood Development dialogue, co-developed by the Natural Resources Defense Council, the Congress for the New Urbanism, and the U.S. Green Building Council. Codified, easily-understandable approaches to sustainable green-building-infused urbanism, now allow developers, planners and citizens to work together toward smart growth that includes natural resource protection, housing affordability, social justice, climate concerns, and public health. Take, for instance, how the Gold Line will facilitate the Chinatown-adjacent LEED-ND-sanctioned Cornfield Arroyo Seco Specific Plan (CASP). The plan aims to transform 650 acres of industrial land into an environmentally-friendly residential and business community along a greenified LA River and Arroyo Seco. Parking will be rented or sold separately, hopefully not at all, allowing new residents to save money by biking or taking Metro. Without strict affordability standards, however, one worries another luxury enclave will surround downtown where lower-cost housing has long been available. Given the challenges of funding and the stagnant economy, the final story has yet to be written. Sharing a city for all economies and ethnicities takes work. LA has always been privatized, its mythos dependent upon possessing our own cypress trees and tropical palms. We build public transit, they will come, and will have to walk to exit. No backyard necessary. Our neighbors will stroll to the station with us, we don’t have to talk, don’t even have to glance, but we’re there, together. I know, coming together in urban (dis)harmony sounds trying. Yet with those neighbors comes events, music, friends, commerce, connection, caring, community, creating a better living environment. Yes it also brings noise, annoyance, invasion of privacy, forced respect, tolerance, acceptance, maybe even a dose of liberalism. It’s often a decent exchange. If you think not, the Palmdales and Laguna Niguels are only a couple hours of stop-and-go away. The Subway-to-the-Sea (and its Exposition Line precursor) is a multi-billion dollar baby-step, yet central to our sustainable future. It is a bloated project, subject to major cost overruns, will supplant funding for many other projects and regions, will cause significant impacts during the protracted construction phase, and will transform neighborhoods and lives. Not all changes will be good, but for once one might walk somewhere, then board a train that may not even be powered by oil, and be whisked somewhere else with more forced walking upon escape. The benefits of funding transit construction through Measure R would be significant, integrating LA’s disjointed and illogical transit network to connect with the Westside, San Gabriel Valley, Central and South LA. Providing viable alternatives to sitting on the 405, twenty years sooner than 2042, would have economic and quality of life benefits for the entire county. LEED-ND standards could be used to guide development of more transit villages while retaining architectural character and neighborhood integrity. Century City’s high-rise condomania and drab office-islands might function as 24-hour destination urbanism with the infusion of subway connections. Maybe someday even LAX will join the 20 other US cities with airport rail service, instead of stranding new arrivals at the rent-a-car desk. Be advised, rail service never pays for itself per se, it generates wealth by energizing neighborhoods and facilitates commerce and less-resource-intensive getting to work on time. Forward-thinking European capitals have developed as compact, public transport-oriented cities with pedestrianized central business districts and segregated bicycle routes. Not to forget the less-expensive, high-capacity long-distance buses as well, such as in Bogota, Colombia and Sao Paolo, Brazil, where land uses and routes have been integrated and streamlined. Our Orange Line Bus Rapid Transit to the San Fernando Valley is an excellent example that could be replicated in other underutilized rights-of-ways throughout the County. There is no one-solution, only multi-modalism for the polyhuman LA. Perfection is never an option when it comes to eight or twenty million of us looking to get to work on time. But maybe we can learn to say hello along the way.